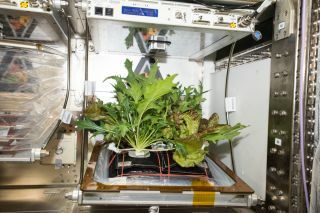 Three different varieties of plants — Mizuna mustard, Waldmann's green lettuce and Outredgeous Red Romaine lettuce — are pictured here, growing in the Veggie plant growth chamber aboard the International Space Station. Astronauts have green thumbs, too! For the first time, an International Space Station project is growing three distinct plant crops simultaneously in space. And just a few days ago, crewmembers installed the largest plant-growth system on the station. Space gardens can be psychologically and nutritionally beneficial to the crewmembers who spend months in microgravity monitoring experiments, making repairs, and doing it all far, far away from loved ones. On Friday (Oct. 27), space station crewmembers harvested their sixth batch of leafy life- forms from experiment VEG-03D in the Vegetable Production System (Veggie). Astronaut Joe Acaba clipped only about half of the greens in a technique called cut-and-come-again repetitive harvesting, allowing the crew to eat future yields of those plants, NASA officials said in a statement. "Joe Acaba harvested Mizuna mustard, Waldmann’s green lettuce and Outredgeous Red Romaine lettuce, providing himself and his crew with the makings of a salad — once they top it with salad dressing sent up by the ground crew at Kennedy Space Center in Florida, of course," NASA officials said in the statement. The mixed crops are intended so crewmembers can benefit from having a variety of fresh produce in their diet, NASA officials added. To continue improving the space station's garden potential, Acaba installed a new plant-growing system after collecting the harvest. NASA astronaut Peggy Whitson happily displayed the progress of the Advanced Astroculture experiment aboard the International Space Station in July 2002. Acaba installed the Advanced Plant Habitat (APH) by following the instructions from the system's project manager, Bryan Onate, and other members of the APH team. The plant habitat is a fully enclosed, environmentally controlled chamber. The plants grow under red, blue and green LED lights, as well as white LED lights in a broad spectrum. To monitor the project, APH team members have equipped the chamber with more than 180 sensors that can relay information such as temperature, oxygen and moisture levels to the Kennedy Space Center in Florida. Once the feeds of the Plant Habitat Avionics Real-Time Manager (PHARMER show that APH is operating correctly, space station crewmembers will initiate the growth of the new plant chamber's test crops. If all goes well, the space garden will soon feature Arabidopsis — small flowering plants related to cabbage and mustard — and dwarf wheat.